At Alan’s Factory Outlet, we pride ourselves on our custom-built Amish storage sheds, and we work hard to make sure that every customer of ours is a satisfied customer. If you’re asking yourself, “Where can I find pre-built sheds from shed companies near me?” then you’ve come to the right place. Learn more about our Amish buildings, then place your order and get fast delivery of your new storage structure! Can I Buy Your Amish Sheds Near Me? You certainly can: Placing an order for one of our wood or vinyl Amish backyard structures is as close as your keyboard! 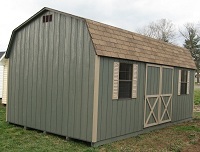 What Type of Siding Is Available on Your Amish Sheds? 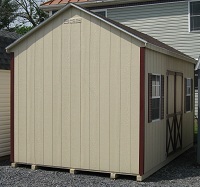 VA and WV customers can choose from several different siding options when buying our Amish-made sheds. Our siding choices include wood, vinyl, and board and batten sheds. 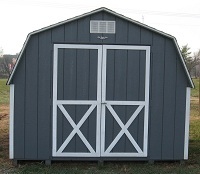 Do You Have Amish Sheds for Sale in a Variety of Sizes? Our pre-made sheds come in many different sizes, ranging from 8-foot-by-8-foot to 14-foot-by-40-foot, and we have 28 sizes available! 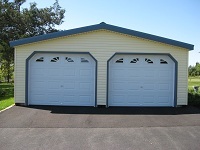 Double-wide storage buildings and 2-car garages that range in size from 20-by-20 to 28-by-40 are also available. For our customers who need more space, we have a selection of 2-story structures. Two-story sheds are available in a single-wide style ranging from 12-by-12 to 14-by-48, and we also offer double-wide 2-story garages from 20-by-20 to 28-by-48. What Are the Available Storage Shed Styles? 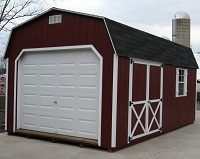 We have Amish sheds in a wide variety of styles, including mini barns, Dutch barns, A-frame sheds, and Quaker sheds. 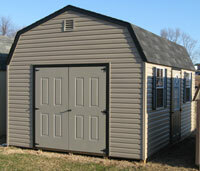 In addition, customers have a choice of a barn roof or an A-frame roof on our sheds. 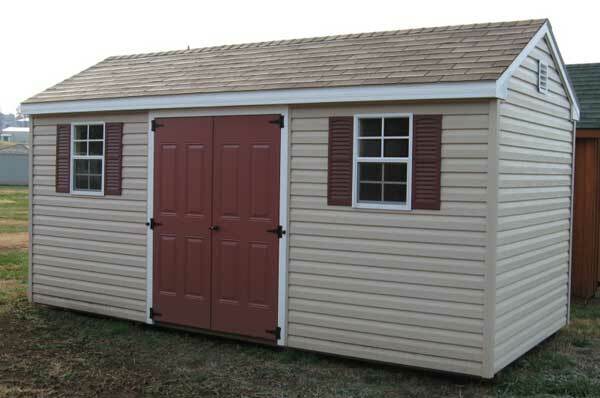 Virginia homeowners and businesses can also order Quaker-style pre-made sheds with an offset roof and an overhang. What Are the Color Options for Paint and Shingles? 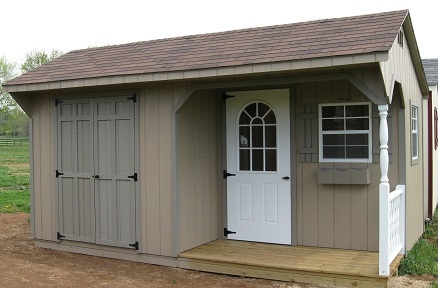 On the wood Amish-built sheds, you can choose the color for the paint, trim, shingles, and shutters. With the vinyl models, customers can choose a color for the vinyl, trim, shingles, shutters, and even the door of each vinyl shed for sale. With the pine board and batten sheds, you have the option of applying stain. Choose a metal roof or shingles: Either way, you can customize the color. What Are the Other Ways You Can Customize an Amish Shed? All styles of Amish sheds except for the mini barns come standard with two windows, but of course, you may add extra windows. They also come with double doors, but you can add an extra set of double doors or an extra single door to our pre-built sheds if you’d like. Gable vents are also standard on our Amish sheds, but you may want to add a ridge vent to the building for more ventilation. 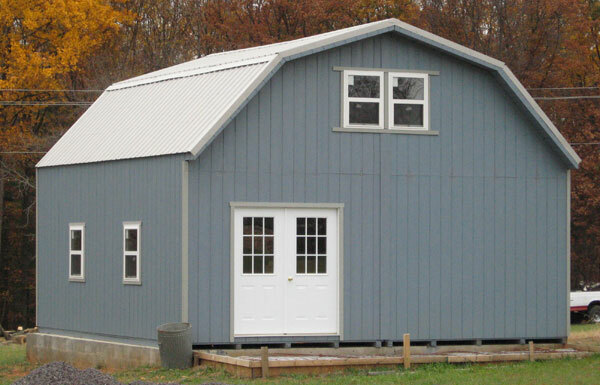 Other options available with our Amish-built sheds include lofts, workbenches, ramps, garage doors, porches, dormers, flower boxes, reinforced floors, pressure-treated floors, and insulated floors. Do You Deliver Amish Sheds Near Me? If you’re a Virginia resident who’s been searching for “shed companies near me,” then look no further. 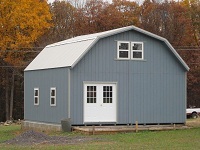 We deliver these high-quality structures in Virginia and West Virginia. Custom buildings can even be delivered for free in 30 local counties in these states, including all of northern VA.
Our buildings are delivered on the back of a trailer. When our crew arrives, the trailer backs into the yard area where you want the shed. Then, our trailer tilts up, allowing the shed to slide off. Once we’re finished, customers can begin filling their new space right away! What Are Amish Shed Kits Like? If you’re confident in constructing your shed yourself, then you might like our Amish shed kits, which give you all of the pieces needed in an easy DIY style that you can assemble on your own. 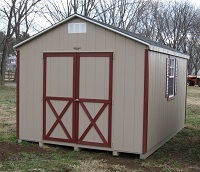 Shed kits are available as mini barns, Dutch barns, A-frames, high-wall A-frames, and Quaker sheds. How Much Does an Amish Shed Cost? When you shop with Alan’s Factory Outlet, you’ll find a great deal on Amish sheds. Prices range between $1,269 for a 6x6 wood shed and $10,277 for a 14x40 A-frame high-wall wood shed. How Tall Should a Horse Shed Be? Many our customers use these Amish-built sheds to shelter their horses. You will want an option that is at least 8 feet tall to comfortably house your horse, although ten feet will be a bit more comfortable for most horses, including ones that stand more than 14 hands tall. What Is a Run-In Shed? A run-in shed is normally used for horses to shelter in because it’s easily accessible to them, with only three sides and at least one large, open doorway. Our customers have countless reasons why they love our products! 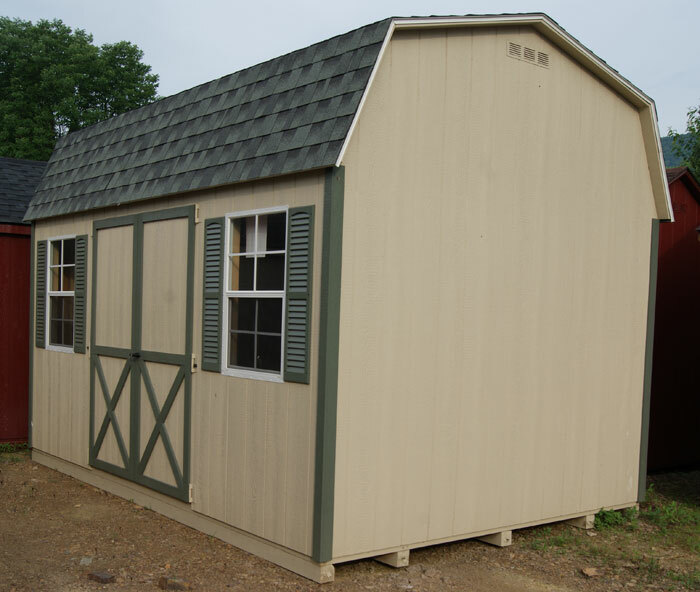 Many of them appreciate the quality construction of our sheds: Whether a customer’s building is made of wood or vinyl, each shed we sell has a level of durability that is second to none. Shoppers can have confidence in the quality construction and design of our products and know that they’re buying better-built sheds than they’ll find elsewhere. Many shoppers like the variety that we offer: We provide our customers with many roof style and color options, so they can choose elements that match their existing landscaping or buildings. Customers often appreciate the variety of sizes we offer, too. For instance, some customers may want a building that can serve as shelter for all of their gardening tools and equipment as well as a lawnmower, while others only need a little bit of space to stow a motorcycle or ATV. No matter what size you need, you can get it here. The detailed designs of our Amish-built sheds attract the attention of many shoppers, too. Of course, these are practical items, but they can also be decorative. There are many reasons to choose Alan’s Factory Outlet, from our great prices to our high-quality products to our knowledgeable service staff, but the only reasons that matter are yours. Stop wondering, “Where can I get pre-built sheds near me that I’ll be happy with for years to come?” The answer is here: Place your order today.